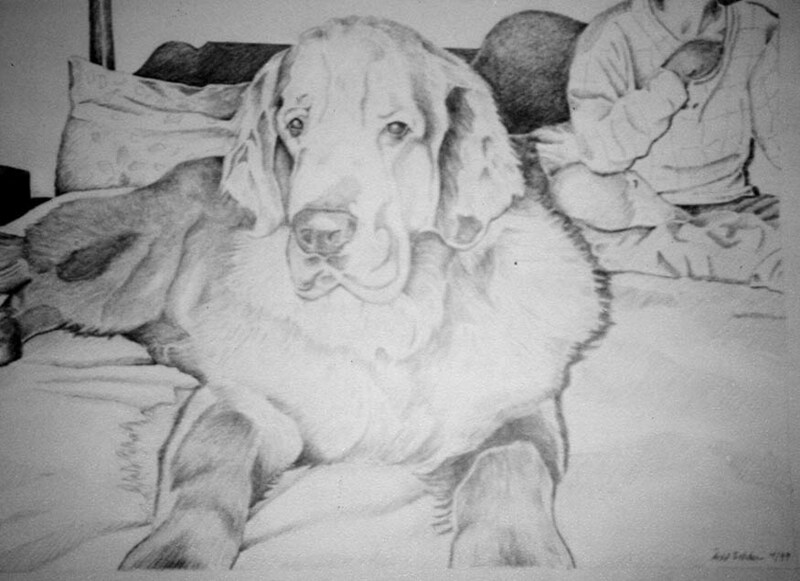 Throwback Thursday with one of Todd’s very first custom pet portraits circa 1999. 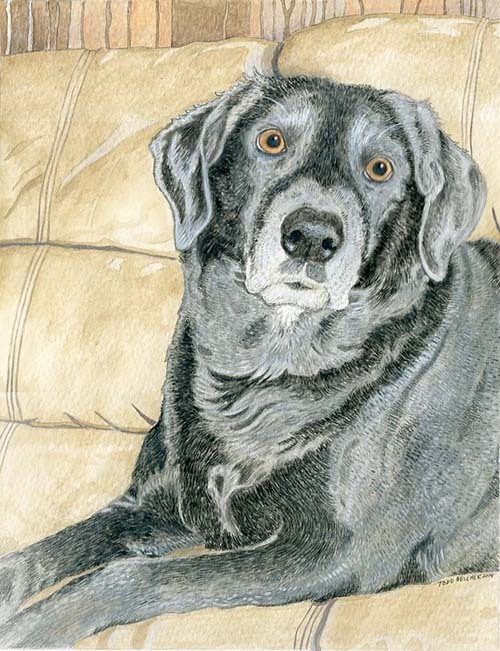 Todd has been an artist all his life and animals have always figured prominently in his work but until a co-worker asked him to draw her beloved Gabby, he’d never thought about doing commissioned pet portraits and found it was something he really loved. Thanks to Carleen and Gabby for starting him on a new career. 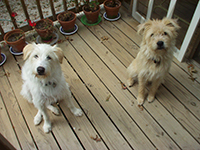 As chief canine officers, we are the top dogs at Jimmydog Design, but we are not the first dogs. First, there was Jimmy. We never met Jimmy, but a thorough sniffing of the offices told us he was a handsome boy, excellent dog (all dogs are excellent!) 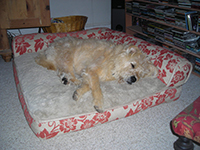 and loyal companion to Stephanie and Todd Belcher, who are our people and also the people behind Jimmydog Design. When Jimmy crossed over the Rainbow Bridge and we adopted the Belchers, we knew we had big paw prints to fill. First, we had to carry out all the normal dog duties—bark at the guy who comes in the white truck and the guy who comes in the brown truck—especially the brown-truck guy! 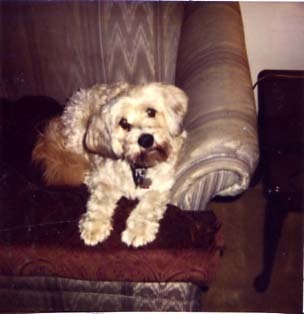 ), take our people for walks, control pests (chase the chipmunks; kill the moles), ride along in the car when our people go places, nap, be petted, play, nap, eat, maybe ride in the car again (! ), be petted, chew bones, nap again. It’s a full day! But none of that pays the bills. Honestly, we’re not sure what “pays the bills” means, but we hear our people say it sometimes. It seems to have something to do with sitting at a drawing table or desk all day. We’re not really built for desk work but we want to help our people pay the bills: We are here to please! In fact, we should have included that in the list of “normal dog duties”: Please our people. Pleasing our people is a big deal. * Enforce work hours Every day, after going potty, eating a bit of breakfast and having some outdoor time, we settle down for a morning nap. That’s the signal for our people to get to work. Our dinner time around 4ish lets them know they better start wrapping things up if they want to be done with their jobs at a reasonable hour. At Jimmydog, we believe in hard work—and hard play. * Coordinating health and wellness activities You can’t paint portraits—or do anything else—if you’re not healthy. 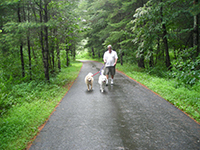 At Jimmydog, that means fresh air and exercise every day—no exceptions. We walk with Todd at least once and sometimes twice a day and with Stephanie as often as we can. In the summer, our people like to swim in the pool. We are excellent lifeguards. * Additional duties as requested Sometimes we are asked to be a sounding boards for ideas. 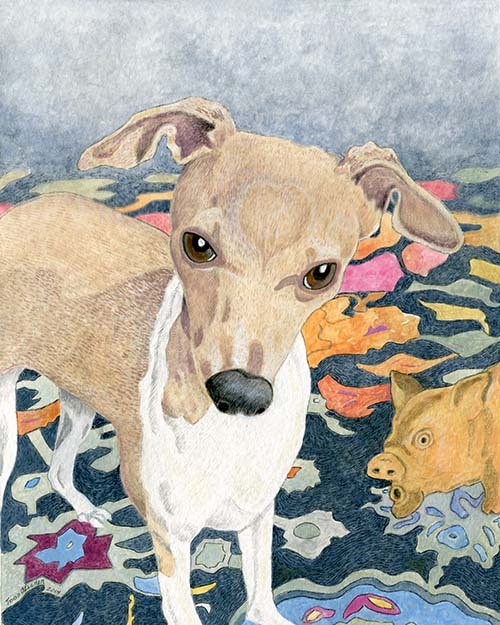 (Yes, we do think that dog’s coat needs a little more ocher.) Occasionally we entertain clients and colleagues during business meetings. Just last week, they told us we were going to start writing this blog. We’re up for anything! We share a lot of duties at Jimmydog but Freddie really likes her sleep so Joey handles most of the night watchdog duties. You never know who might intrude. Meanwhile, Freddie take the lead as floor manager. The floor needs to be monitored at all times for creeping and crawling intruders. And the minute a person’s foot hits the floor, we’ve got to be ready for action: We might be going somewhere in the car! Truly, the list of our responsibilities is never-ending, but we don’t mind. Working at Jimmydog is the best job ever. We couldn’t say no. 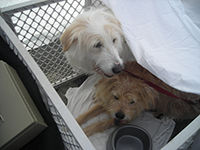 Freddie and Joey, a pair of rescued terrier mixes who entertain and inspire us every day at Jimmydog Design Group, are hard working and deep thinking. We’ve given them complete editorial freedom and look forward to reading, right along with you, what’s on their canine minds. Their first blog follows in the next post. Holiday portrait of the moment: Meet Jackson, a Winston Salem native who loves nothing better than a long walk outside with his pack. As if we need any more proof that animals feel real emotion and have hearts and souls. 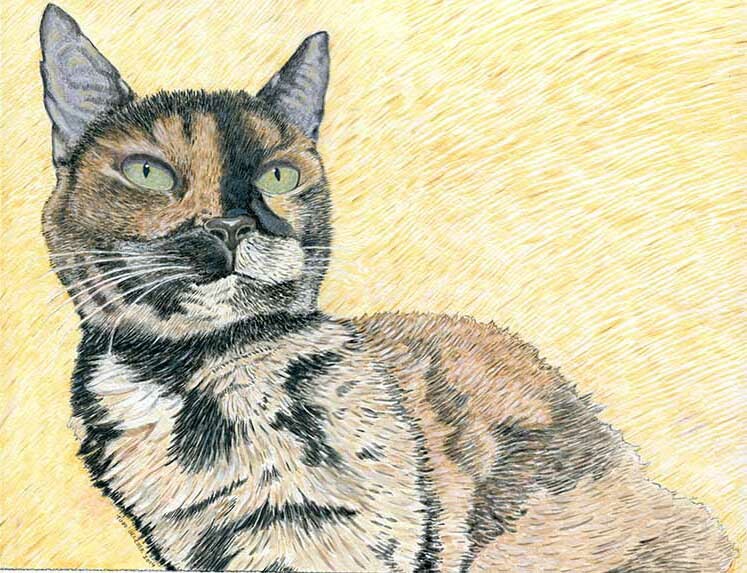 Holiday portrait of the moment: Meet Anna who sadly has gone to the rainbow bridge but is honored and remembered in this beautiful memorial portrait. 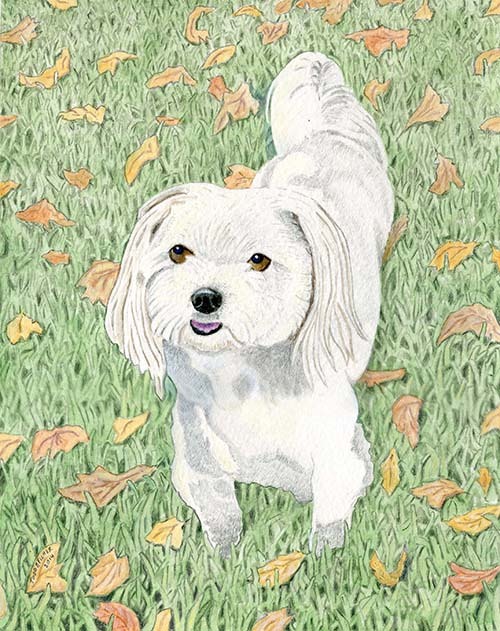 The holiday’s are over and Todd enjoyed a much needed rest but is always thankful that he can share in so many happy holiday memories painting beloved pets for one of kind gifts. 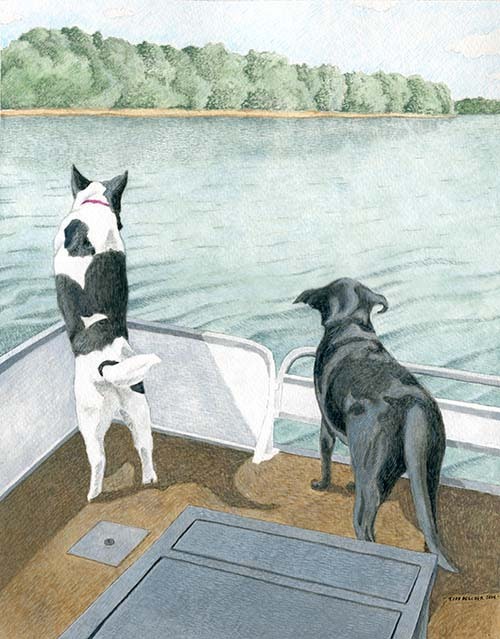 Today we’d like you to meet avid boating dogs, Amos and Piper.